Seminar INTENTION 2016 "Develop Local Go Global"
󾒲Place : Sakura Meeting Room Floor 1, Grand Tropic Suites Hotel Grogol, Jakarta. 3. Send Confirmation massage along with the payment receipt with format : Full Name_University/Institution_Phone Number via email to intention.trisakti@gmail.com or via our CP's Line or Whatsapp. DON'T MISS THIS CHANCE !!! 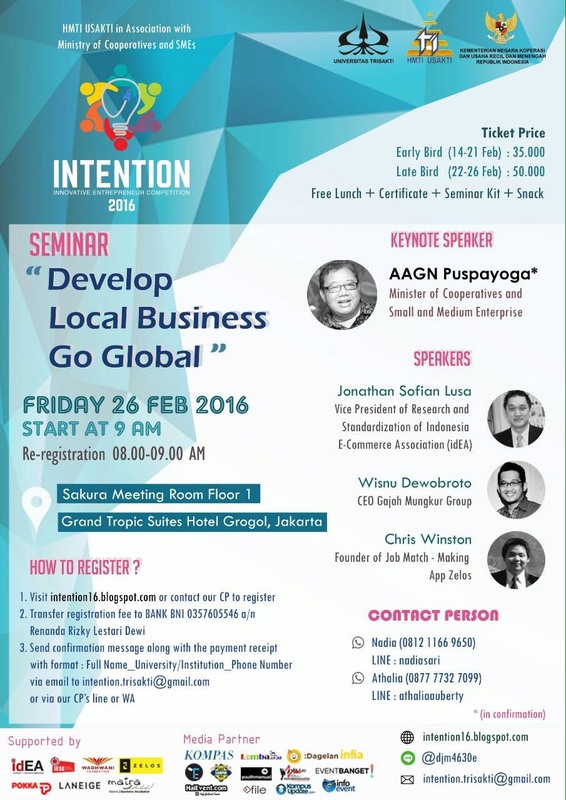 Belum ada Komentar untuk "Seminar INTENTION 2016 "Develop Local Go Global""